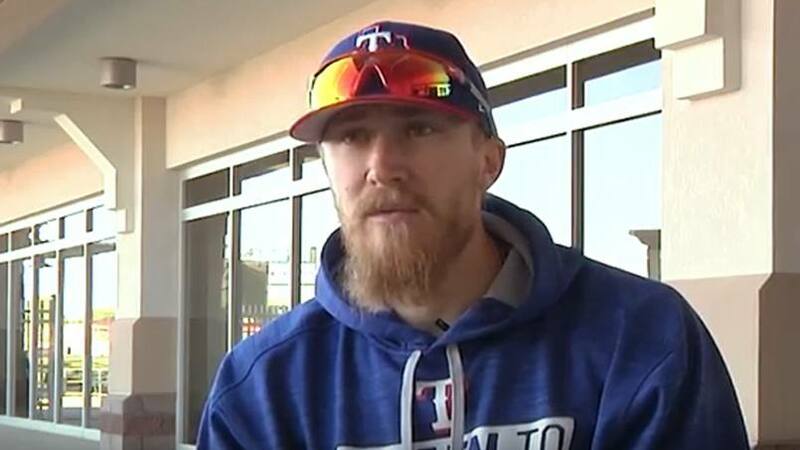 After recovering from treatment for ulcerative colitis, Texas Rangers relief pitcher Jake Diekman is back on the mound. He's also using his experience to help others and raise funds for research. Jake Diekman has had a busy year. The relief pitcher for the Texas Rangers got married, announced (adorably) that he'd be welcoming a daughter, and — oh, yes — returned to the bullpen after spending five months on the DL. (That's baseball talk for getting back to work after medical leave.) All in a day's work for Jake. Or as he might phrase it, "#nocolonstillrollin." We introduced you to Jake last year, just before he made his return to the mound for the Rangers. He'd come to Mayo Clinic for treatment of the ulcerative colitis that had plagued him since childhood. "Jake was not able to maintain his quality of life. He was not able to maintain the physical activity level he needs," Robert Cima, M.D., Jake's surgeon, told the Star Tribune at the time. "And given his profession, that was a big issue." Fixing that "big issue" was no small task. First, Jake had his colon removed in a procedure called a colectomy. Then doctors used his small intestine to replace his colon. "They took out my entire colon and basically just pulled down my small intestine and said, 'Here you go,'" Jake tells Yahoo! Sports. That rerouting required three surgeries, an ostomy and months of recovery. All of which Jake shared not only with his family and friends, but also with his fans on social media. "People don't like to talk about it," Jake tells MLB.com. "It's something that people are embarrassed about, or they feel like it's personal. But a few years ago, I decided that I'll talk about it as much as I can." He's done more than talk. Last year, Jake and his wife, Amanda, launched the Gut It Out Foundation, which works to "bring people together, connecting patients and families to raise a community where people aren't afraid to talk about the good and the bad of IBD." The foundation will also raise funds to find a cure for ulcerative colitis and other IBDs, also known as inflammatory bowel disorders. To that end, the foundation recently donated $10,000 to fund research at Mayo Clinic. Jake's efforts off the field have not gone unnoticed. He's received two MLB awards, the Richard Durrett Hardest Working Man Award ("given to the Rangers player who gave his all during the season") and Hutch Award ("for outstanding community service"). But perhaps his greatest accolades have come from others living with IBD. "Just wanted to thank you for being so forthcoming and open with your disease," one wrote in response to an Instagram post. "It's not easy for a lot of us to talk about what we go through, and it really means a lot to have someone like you putting it out there for the world to see. Keep fighting the good fight." If you're in Minnesota, you can watch that good fight yourself when the Rangers take on the Twins in a three-game series at the end of June. And you can always score with us by leaving a comment below before using the handy social media tools atop this page to share this story with others. Read about Mayo Clinic's Department of Colon and Rectal Surgery.